Add potatoes to about 3 quarts water in a large pot and boil for 5 minutes until potatoes can be pierced with a fork. Drain potatoes and set aside. In a large pot (6 quarts) heat to medium-high 2 tablespoons olive oil. Add the onions and carrot and cook stirring frequently for 5 minutes. Add garlic, fennel, parsley and thyme and cook stirring frequently for 5 minutes. Add the tomatoes with the juice and cook for 10 minutes. Add the fish stock and bay leaf and bring to a boil. Add remaining 2 tablespoons olive oil and continue to boil for 10 minutes. 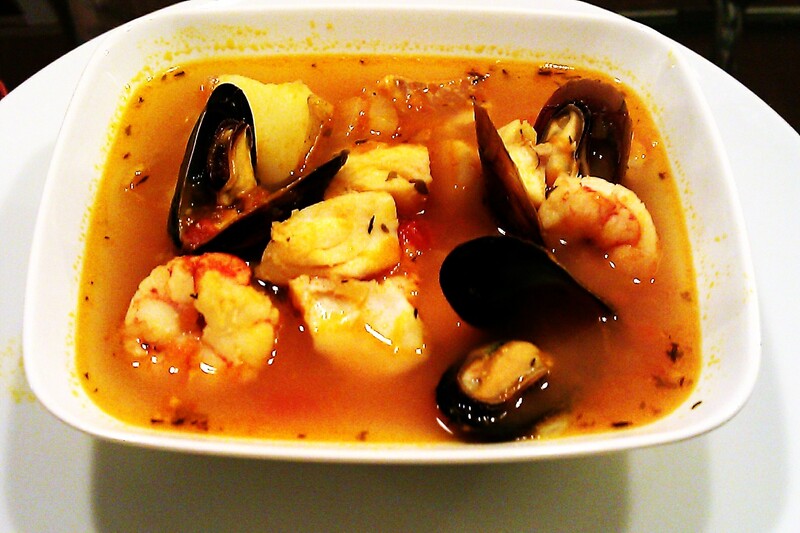 Reduce heat to a simmering boil and add the fish, shrimp, scallops, mussels and potatoes. Add salt, pepper, lemon. Cover and boil for 3 minutes until all the mussels open. Discard any mussels that do not open. Discard the bay leaf. Serve hot with warm tortillas or sourdough bread. Oh does that look perfect for a freezing cold day. Some nice fresh bread to dunk in there – heaven. Thank you. I actually printed Niki’s Stuffed Chicken Wrapped in Prosciutto recipe. I was going to make a Chicken Scaloppine with Wine Sauce but the store was out of thighs so I bought chicken breasts. When I got home I thought of your recipe. I’ll have to improvise a few ingredients I’m missing, the chicken will be breaded and I’m making the wine sauce. I hope it turns out good! I think we all just have to meddle in recipes, it’s just one of those things. I’d love to hear how yours comes out. I know Niki’s friends really enjoyed it. Looks like the sort of thing I’d eat everyday if I could! So warm and cosy!! It looks more friendly than Bouillabaisse. I’m always turned off by the sea monsters in my dish. YUM! That looks soul satisfying! Soul satisfying it was. Thanks!